You Say Tomato, I Say Tomato. A Fresh Tart for Summer Entertaining! We threw this together for an annual brunch block party. It was gone in mere minutes and we only got one tiny slice to share. We love tomatoes in the summer. And even though it’s not officially summer, it’s been such nice weather that we thought it was time to break out this simple and delicious tart. The best is when we find the big, sweet Jersey tomatoes. Sprinkled with a little salt, they are amazing. We grow tomatoes in our garden and they have a very good flavor but nothing compares to those Jersey tomatoes. For this recipe we just used store bought tomatoes as it is still a bit too early in the season to find good local ones. This tart can be made with most any cheese but Gruyère is the most common cheese to use. It would be delicious with an herbed goat cheese too. We used shredded cheddar this time, as it was all we had on hand and it was already shredded. You can also drizzle a little bit of balsamic vinegar on top right before you serve but it’s not necessary. This is a perfect meal in itself when served with a handful of salad greens on the side or it makes a nice side dish. Sometimes, we will make small individual ones for parties. It’s very versatile! In the bottom of the tart shell, evenly spread the mustard. 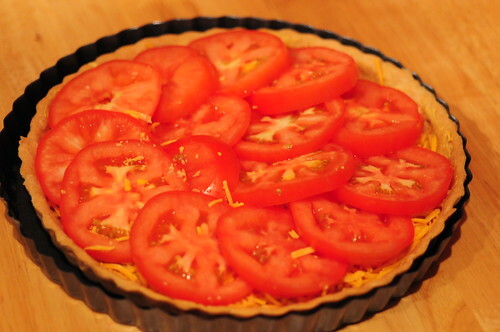 Arrange the tomatoes in a circular pattern slightly overlapping them on one side. Sprinkle with salt and pepper. Bake for 30 minutes or until tomatoes are fork tender. 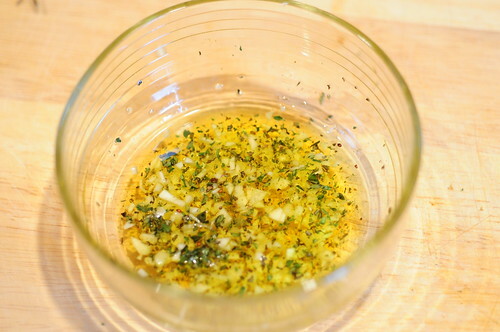 In a small bowl, whisk together the olive oil, thyme, parsley and garlic. 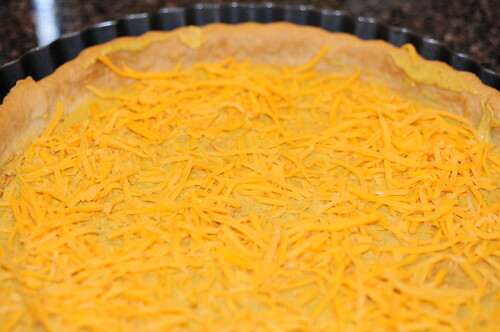 Spread over the baked tart while it is still warm. Tart can be served either hot or at room temperature. This buttery dough is our standard tart and quiche crust. It’s produces a firm crust, making it perfect to hold up well with weighty ingredients. The dough can also be made by hand by using two knives to cut the ingredients into one another or by food processor. We have given you the conversions to the weighed ingredients. It’s a good idea to make several batches at a time as it freezes really well and you will always have some on hand for a last minute meal. The key to a good crust is to use very cold butter and very cold water and to not overwork the dough. In your food processor fitted with a dough blade, add flour and salt. Cut butter into very small pieces and add quickly to the flour and salt. Pulse until the butter is well incorporated and resembles a fine meal, about 15 seconds. Add the cold water and pulse a few more times until the dough comes together. Turn dough out and form into a ball. Cover with plastic wrap and place in refrigerator to rest for ½ hour. The dough can also now be frozen for future use. On a lightly floured surface, roll out the dough to fit into an 11” tart pan. The key to making sure your dough is the right size is to turn your tart pan upside down over the dough and making sure there is at least another inch around all the sides still visible. Transfer to the tart pan gently pressing the dough to the pan’s shape. 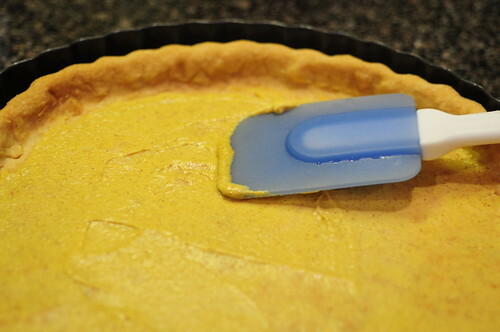 Prick the bottom with a fork to prevent the dough from puffing during baking. To prebake the crust, preheat oven to 400 degrees F and place rack in center of oven. Line the unbaked crust with a round cut out of parchment paper or aluminum foil. Fill tart pan with pie weights or dry beans, making sure they are evenly distributed over the entire bottom surface. 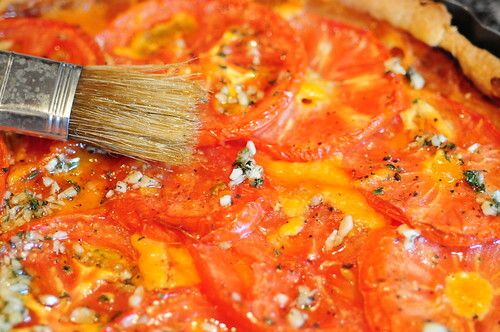 Bake crust for 20 to 25 minutes or until the crust is dry and lightly browned. Remove weights and cool crust on wire rack. Proceed with your recipe that calls for a prebaked crust. To par bake, only bake for 10 minutes to set the shell and ready for ingredients. So without a doubt…this is what I’m using my tart pan for next. This looks amazing! That picture made my mouth water! This looks absolutely divine. I definitely think I’ll be trying it in the very near future! One of my very favorite summer dishes — and you’re so right about the entertaining. 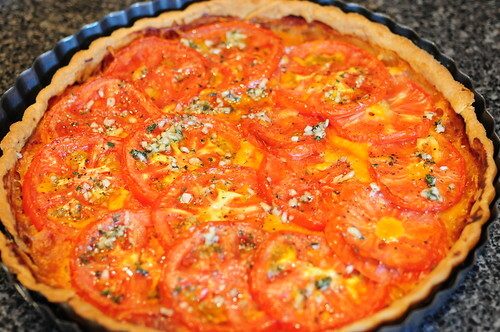 I have a friend who grows incredible tomatoes and when she can’t keep up with them, I get them and make tomato tarts. I could go for one of these for dinner about now. Wonderful!